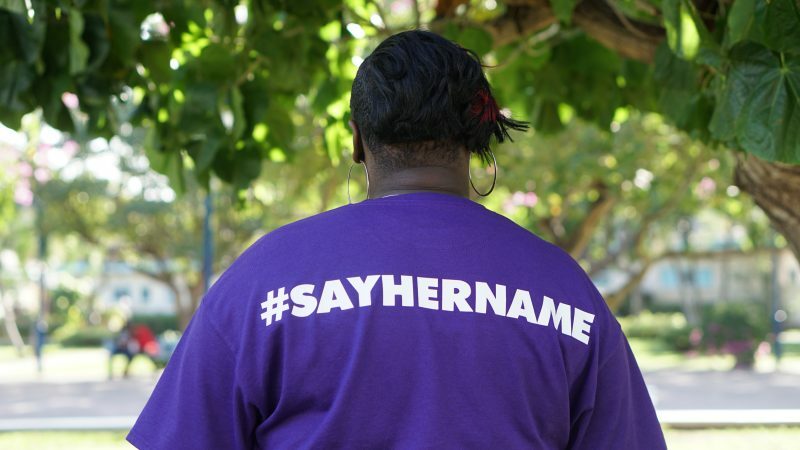 American human rights activist Katrina Johnson wears a t-shirt emblazoned with the hashtag #SayHerName. It is part of a wider campaign by Amnesty International (using another hashtag, #SheStands4Justice), which draws attention to the issue of police brutality and extrajudicial killings in the Americas. Photo by Mario Allen, courtesy Amnesty International, used with permission. This is the final instalment in a three-part series that features three women — from Jamaica, Brazil and the United States — brought together to highlight the issue of police brutality and extrajudicial killings in the Americas, with the hashtag #SheStands4Justice. They visited Kingston, Jamaica recently to share their thoughts in the aftermath of the death of a family member. Read the first part  here and the second part  here. In March 2018, Seattle, Washington resident Katrina Johnson — along with Brazilian activist Ana Paula Oliveira and Kingston-born Shackelia Jackson — visited Jamaica as part of an Amnesty International campaign that was supported by local human rights lobby group Jamaicans for Justice . Dubbed “A Journey for Justice in the Americas”, the campaign focused on the persistent legal, social and psychological challenges that many families face after a relative is killed by the police. While the shock of the death itself is bad enough, grief-stricken relatives often find the struggle to get answers from their respective judicial systems difficult and distressing. Johnson noted  that some time after her cousin's death, the police officers responsible were taken off duty. An investigation followed, but before it was complete, the prosecuting attorney told her the officers would not be charged. In the state of Washington, a declaration by law enforcement that they were in fear of their lives was sufficient to grant them immunity from prosecution. The investigators said her cousin — a small-framed woman who had called 911 to report a possible burglary — might have been holding a steak knife. In the midst of the tragedy, Johnson began helping other families  in similar situations through a local organisation, explaining, “I have to grieve and fight at the same time.” She helped form a coalition of citizen and minority groups, trade unions and attorneys, which lobbied for the law in Washington state to be changed. The De-Escalate Washington  campaign drafted a submission in May, 2017 (Initiative I-940) ; by March 6, 2018, there was success. After gathering over 250,000 signatures to get the Initiative on the ballot, a law was passed  that “held police officers accountable for using deadly force unjustly,” said Johnson. The new law also mandates a range of training programmes for police officers, including de-escalation of violence, implicit bias, mental health and first aid. During her Kingston visit, Johnson called for police reform in both Jamaica and Brazil. She expressed solidarity with her peers, who told of their own struggles at a March 13 forum at the University of the West Indies’ Mona campus. 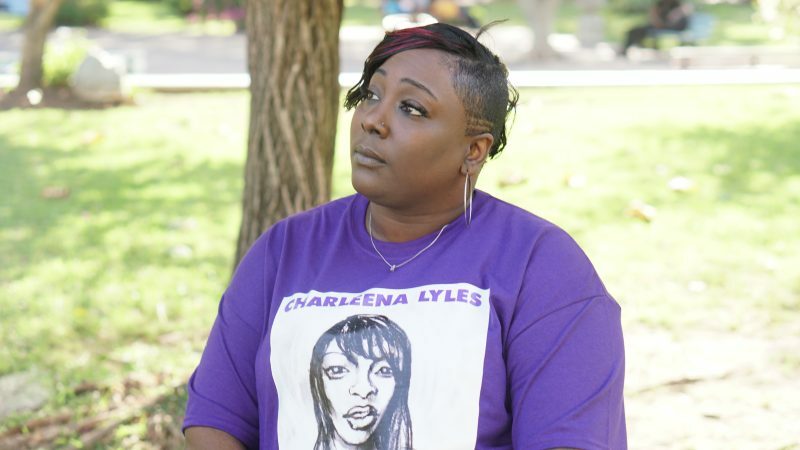 American activist Katrina Johnson, wearing a t-shirt with an image of her cousin Charleena Lyles. Lyles was killed by Seattle police in front of her children. Photo by Mario Allen, courtesy Amnesty International, used with permission. GV: In your view, how should the problem of extrajudicial killings be tackled — in your country and across the Americas? What, for you, is at the heart of this issue?